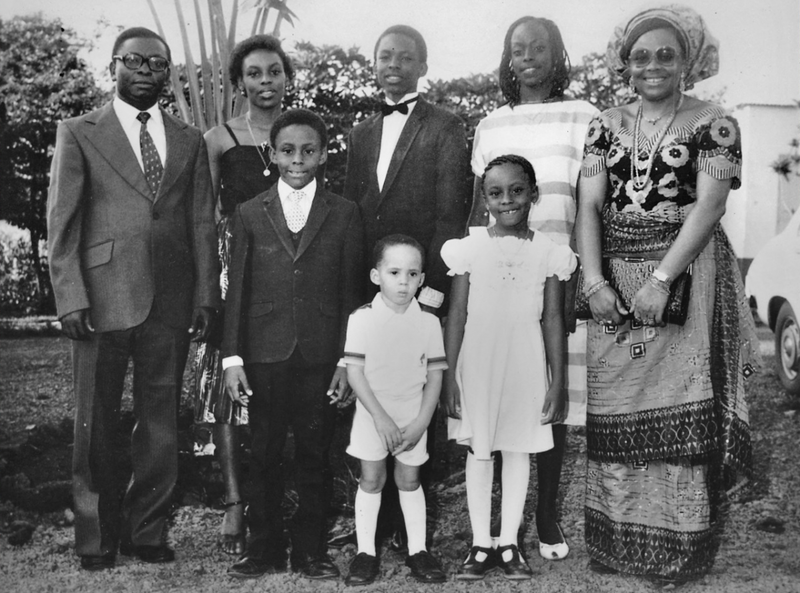 Near and Dear: Front row, the author at age eight in Nigeria, 1985, with her immediate family: two sisters, three brothers and, bookending the group, her father and mother. I first knew there was such a thing as blue mascara because of Aunty Chinwe. She came to visit my mother one Saturday, her braids held sleekly at her neck, her caftan’s silver embroidery gleaming and her lashes the bright color of a crayon. Against her dark skin, they were striking. “Aunty, your lashes are blue!” I said. “Yes, my dear. It’s blue mascara,” she told me with a smile. She was always smiling, eyes crinkled, teeth very white. I liked most of my mother’s friends—funny women, kind women, brilliant women, and there was the one soft-spoken man—but only to Aunty Chinwe would I say something like that. Aunty, your lashes are blue! She had an air of endless tolerance, of magnanimous grace; she turned every room she entered into a soft space free of the thorny possibility of consequences. With children, her manner was that of an adult just about to hand out lavishly wrapped gifts, not for a birthday or Christmas but simply because children deserved gifts. I sneaked into the parlor whenever she visited, and sat in a corner, and eavesdropped on her conversations with my mother. Because she drank Fanta elegantly from a glass, I eschewed bottles and began to drink my Coke from a glass. I loved simply to look at her: petite, graciously fleshy, with a dark-dark complexion that made people think she was from Ghana or Gambia or somewhere not Nigeria where beautiful women had indigo skin. At her clinic she gave injections with the gentlest touch. Whenever I was sick with malaria, my parents would make the hour-long drive to Enugu, where she lived, because they knew that only Aunty Chinwe holding the needle would keep me still enough to get my medicine. When I was 13, my parents briefly considered transferring me to another school, one that was even more rigorous than my already rigorous school. The entrance exam could only be taken in Enugu—the university town where we lived, Nsukka, being too small to be a regional examination center—and so my mother took me to stay with Aunty Chinwe, in her large house with the grand staircase and spacious rooms. They always had guests. Uncle Emeka would crack joke after joke, poking fun at everyone and at himself. There was a story about how he went to America and did not know how to use a vending machine. Another about somebody farting loudly on a plane and pretending not to know. “Let’s have more drinks!” Uncle Emeka said often. He struck me as a man who liked the gratitude of other people. I spent hours with Aunty Chinwe. I went along when she visited a patient of hers, a diabetic man with a stubborn cut on his foot. As we left his home, I told Aunty Chinwe, “I don’t really want to study medicine in university.” My teachers and parents expected that I would become a doctor because I did so well in school. I had never told anyone how bored I was by biology, how all I wanted to do was read and write. Her words made me feel lighter. I showed her a short story I was writing, in a lined notebook that was also my study book. evening before I left, one of their guests talked about a man who had lied about his date of birth at a job interview, because the company wanted younger workers, and was now scrambling to get a forged birth certificate as proof. He roared with laughter. It was an odd, irrelevant joke. From the visitor came an uncomfortable chuckle. Aunty Chinwe smiled and changed the subject but not before I saw a fleeting clenching of her jaw. She would say nothing, not because she did not want to but because she felt she should not. The visitor looked relieved, grateful to her for saving him further discomfort. I noticed then how Aunty Chinwe had no sharp angles in her personality. She had blurred them all. She was an ocean of endless nice. I was 15 and asking many questions of the world. Aunty Chinwe was visiting my mother to tell her about a surprise birthday party for Uncle Emeka. From a bucket-shaped leather bag she withdrew sketches of cakes, sheets of handwritten lists, a small pile of photographs. She gave those to my mother and asked which image of Uncle Emeka would look best on the party souvenirs; she was making ceramic mugs and bottle openers. My mother studied one of the photographs for a while, and I went closer to see. It looked recent, taken at a wedding filled with festive balloons, Aunty Chinwe in a red blouse and wrapper and Uncle Emeka in a red tie and dark suit so tailored it seemed sharp edged. Aunty Chinwe looked at the photo. “He did not shave that day,” she said. I’m not sure why I so clearly remember that now, years later. He did not shave that day. The way she said it, with intimacy, with pride, as though the photo brought a memory she treasured but would not share. A tone that was about what was hers and hers alone. “Three hundred guests. This is not a small thing!” my mother said. Her words were layered, dense with unspoken compliments: how dedicated a wife Aunty Chinwe was, how impressive spending her own money on this party, how grand that she had the money in the first place. My parents were senior university workers wrapped in the familiar comforts of the middle class. They had two cars and a house and relatives whose school fees they paid, but neither could plan a party for 300 guests without the other knowing, because they would have to pool resources. I remember my brother asking my parents for a Pac-Man video game when video games were still exotic things, and he tried to make it normal by telling them his classmate owned one. “That’s because those people have extra money,” my mother said. She meant academics who dabbled in business, like the professor who invented a yam-pounding machine, and another who made wine from cashews. We did not have extra money. Aunty Chinwe had extra money. Her father came from old Igbo wealth, his family had traded in palm oil with the British 100 years ago, and they owned property all over eastern Nigeria. In Enugu, where Aunty Chinwe had grown up, a street was named after her father. Even if she did not work as a general practitioner in her own clinic, she would still have extra money. And in my eyes, it cast a patina of glamour over her life. Her money meant choice, that she could plan a surprise party if and when she wanted to. My mother and I went to Aunty Chinwe’s house the day before the party to help with preparations. Caterers were doing the real cooking, so we just sat around in the kitchen making chin-chin, me rolling the dough flat, my mother cutting it into careful small squares, Aunty Chinwe frying until the air tasted delicious. She had told Uncle Emeka that the food was for a relative’s baby shower the next day. Her soft voice suggested that I was doing something shameful but that nobody else needed to know of it. When I was little, my mother taught me how to sit properly. “Close your legs” was how my mother said it. Thighs pressed together. Once I asked why and my mother said, “Because you are a girl and girls wear dresses and have to sit with their legs closed so that nothing shows.” Maybe my mother could tell that I thought this a lightweight reason, because she added that an ant had once crawled in and stung a girl down there because she sat with her legs apart. I was wearing trousers, and the most comfortable way to sit on that stool was not with my legs pressed together. “Aunty, I’m wearing trousers,” I said. I realized that it was a ritual that had to be performed, this sitting properly. A ritual about female virtue and female shame. One of the many rituals for which you received mainstream approval if you just performed them and asked no questions. Sit like a woman was a small example of bigger rituals. Be quiet and gentle like a woman. Don’t be loud, don’t be angry, don’t be tough, don’t be too ambitious. I did not want to perform them. I wanted to be able to sit in a way I considered most comfortable. Later, it would occur to me that Aunty Chinwe’s entire life was about performing the rituals of femaleness. She had the world’s approval, and she wore it like a favorite tasteful dress. Delicate rosettes had been made from white tissue paper and strung through a bough that framed the doorway. Tables were covered in white cloth. White roses stood in tall vases. The atmosphere was of seamlessness, of sophistication that was not too much. “Chinwe di egwu,” my mother said. The Igbo expression di egwu is difficult to translate because of its nuanced, shifting meanings. To be remarkable, unusual, wonderful. My mother used it both for people she admired and for people she found odd. Aunty Chinwe looked beautiful in a peach dress. “I think Emeka knew about it all along!” she said, smiling. A coral necklace was coiled around her neck. She had the energy of a stage actor on opening night, excited, anxious, eager to convince her audience about the version of herself she would be showing them. Before he cut his cake, he made a speech. He called Aunty Chinwe his queen. He said she was perfect and she made many sacrifices for him and she knew exactly what he wanted to eat every day and she gave him business advice and she shopped for all his clothes and she knew where everything he owned was and she had given him three beautiful children and she decided what happened in their house and he was lucky to have it so. The guests cheered and clapped. From every corner of the room, praise flew. Aunty Chinwe was coated in praise, sunk in praise. She was smiling and glowing. “Perfect wife,” a friend of my mother’s said. It troubled me that Aunty Chinwe’s perfection was couched only in terms of what she did for her husband, and not what she was. Not about her intelligence, her humor or how well she gave injections. Later, I would learn that Aunty Chinwe, born Anglican, had converted to Catholicism when she married Uncle Emeka. She transformed herself, became the person he wanted her to be. Something happened the night of that party. A woman, drunk from many bottles of Guinness stout, began to say things to Aunty Chinwe. About Uncle Emeka. About the two-year-old son he had with a girl from Imo State. Aunty Chinwe was crying softly in the guest room, my mother cradling her. She looked vague, lost. She spoke in very low tones. “I did not shout at him,” she told my mother. Later, I overheard my mother and Aunty Ngozi talking about Aunty Chinwe. She had handled it well, they agreed. It was the best thing to do. Why fight about it and raise more dust? Aunty Chinwe was an ideal, an idea. My mother and other women I knew might not have been like her, but they idealized her. They not only accepted what she represented, they aspired to it. Aunty Chinwe’s experience did not cause me to ask the questions I was asking. But it shaped them. Her life brought my musings to life. Why did her response have to be tidy to be admired? Why had she not raged at the world in her humiliation, and if she had, why would that not be admirable? It seemed to me more human, more honest. She asked nothing of the man she loved, and this was seen as praiseworthy. To love was to give, but surely to love was also to take. Why did she not take? Why dared she not take? Why did her perfection depend on her not taking? Shortly after the party, Aunty Chinwe changed her name. From Dr. (Mrs.) Chinwe Nwoye to Dr. (Mrs.) Chinwe Emeka-Nwoye. It was the vogue, in the 1990s, for newly married middle- and upper-class Nigerian women to take a clunky hyphenation of their husband’s first and last names. But it was a strange choice for Aunty Chinwe. She was not newly married, and her generation hadn’t done that. It was as though her response to her humiliation was to further erase herself, further sink indistinguishably into Uncle Emeka. Or to tell the world that he may have a child with another woman but she was still his wife, and being his wife was what mattered. My feelings toward Aunty Chinwe then began to curdle. The attributes I had once so admired now irked me. What I thought her ethereal niceness became merely an addiction to the shallow rewards that the world reserved for females who hid certain parts of themselves. Most of all, her experience frightened me, confused me, because she was not easy to explain. I was 15 and naive, full of the uncompromising certainties of youth. I would come later to admire her again and seek her wisdom at different times in my life. I would come to realize that Aunty Chinwe was not the problem; our society was. It was not about individual women but about the forces in the world that made those women shrink themselves. Aunty Chinwe taught me that wealth did not shield a woman from those forces. Nor did education or beauty. She helped shape my resolve to live my femaleness as the glorious and complex thing that it is. To reject “because you are a woman” as a valid reason for anything. To strive to be my truest, most humane self, but never twist myself into shapes to court the approval of the world. 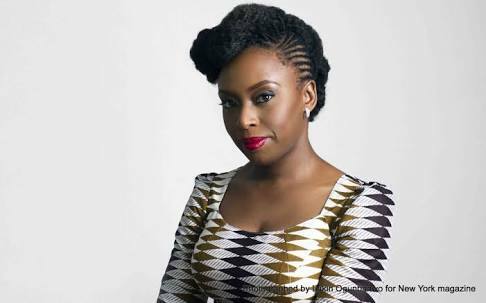 Chimamanda Ngozi Adichie is a novelist and short story writer whose work has been translated into 30 languages. Her most recent novel, Americanah, won the 2013 National Book Critics’ Circle Award for Fiction. She divides her time between Nigeria and the United States. Couldn’t stop my self from posting this. Hope you enjoyed it as much as I did…. ?